We have made nearly a dozen posts about the 1967 riot in Grand Rapids in the past several years. Some of these posts have focused on media coverage of the riot, some on internal documents and some of the posts have looked at other archival items we have come across in our research. The latest poster from GVSU student, Hannah Pewee, beautifully depicts the police violence against black youth, which was the spark that set off the riot in 1967. The print/poster also uses a quote from a GR Press editorial to demonstrate how white people viewed African Americans in 1967. 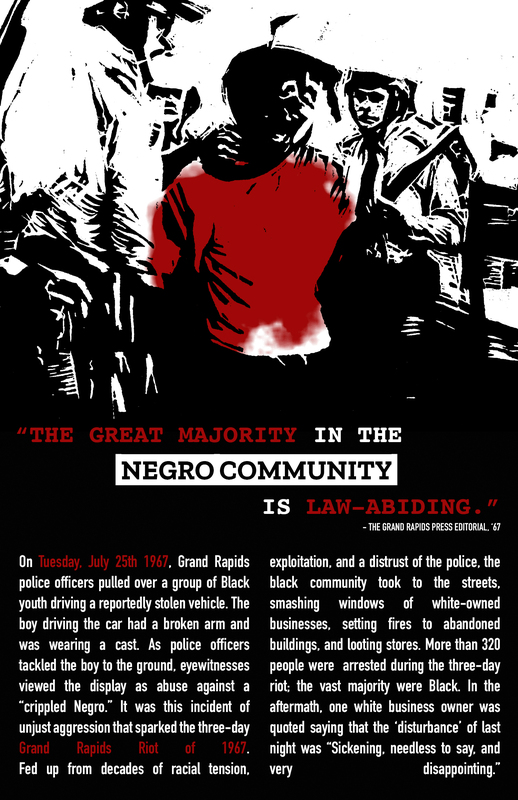 For more information on the 1967 riot in Grand Rapids, checkout this post, which provides an overview with multiple links on the topic. This entry was posted in Civil Rights/Freedom Movement, People's History Artwork and tagged 1967 riot in Grand Rapids, media coverage of the 1967 riot, police violence in Grand Rapids. Bookmark the permalink.